AMD looks to continue the momentum it has with its current-generation of EPYC processors. AMD introduced first-generation EPYC processors based on the Zen architecture in June 2017. The flagship model, EPYC 7601, topped out at 32 cores and 64 threads. Dr. Lisa Su revealed today at AMD’s Next Horizon event in San Francisco that the company has been working hard behind the scenes to bring the second-generation EPYC processors to market. The second-generation processors will feature the latest ‘Zen 2’ CPU architecture and an innovative modular design that allows for EPYC processors to have up to 64 cores and 128 threads per CPU! That is double the number of cores and threads than what is presently available while using AMD’s latest architecture and manufacturing processes. The new multi-chip processor uses TSMC’s 7nm process technology for the “Zen 2” CPU cores, while using the 14nm process technology for the input/output portion of the chip. This modular system design uses an enhanced version of AMD Infinity Fabric interconnect to link separate pieces of silicon (‘chiplets’) within a single processor package. AMD says that the result is much higher performance since they are able to offer more CPU cores at the same power, and that it is more cost-effective to manufacture than traditional monolithic chip designs. 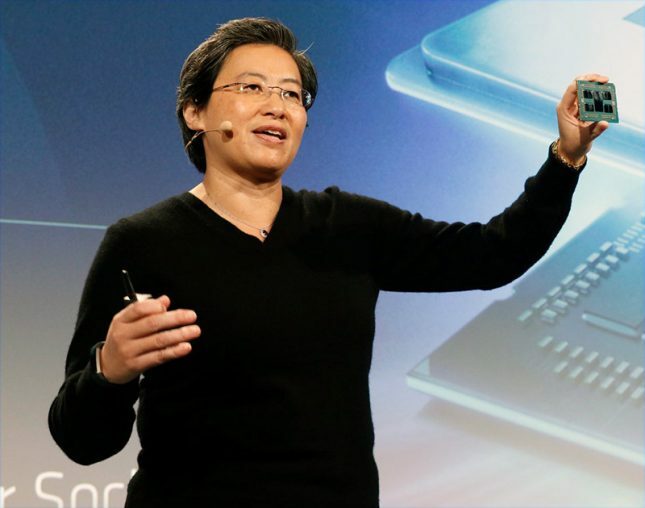 The image below shows Dr. Lisa Su holding the next-generation 7nm EPYC server processor codenamed ‘Rome’ and this is the first public showing of the chip. AMD also noted that they are making platform enhancements for EPYC and these include PCIe 4.0 support. Yes, the new ‘Rome’ CPUs are the industry’s first PCIe 4.0-capable x86 server processors. That means double the bandwidth per channel and that will help datacenter accelerator performance. Memory support remains at 8-channels, so no change on the memory front. It appears that AMD is truly committed to the datacenter and that is great news. At the Next Horizon event AWS announced immediate availability of new R5, M5, and T3 instances featuring AMD EPYC processors. The EPYC momentum continues to grow!